LONDON, June 26 -- Chinese Premier Wen Jiabao said Sunday here that enhancing communication and cooperation between the world's big powers is particularly important in face of a variety of global challenges. Wen expressed his opinion when holding respective meetings with former British prime ministers Tony Blair and Gordon Brown. 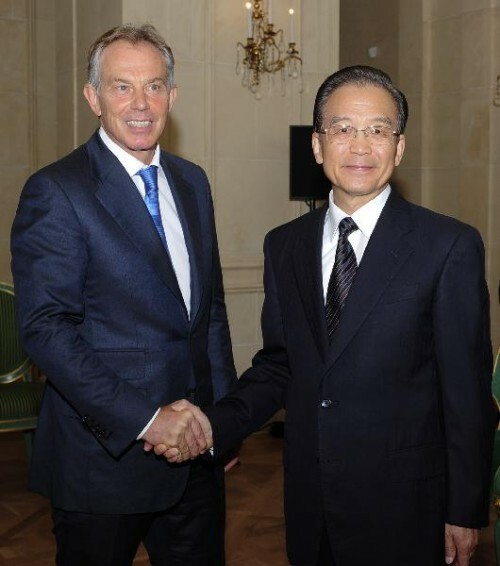 Chinese Premier Wen Jiabao (R) meets with former British Prime Minister Tony Blair in London, Britain, June 26, 2011. 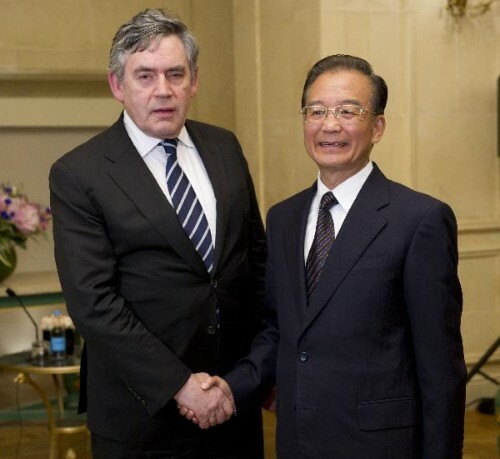 Chinese Premier Wen Jiabao (R) meets with former British Prime Minister Gordon Brown in London, Britain, June 26, 2011. Lauding the contributions that the two former British leaders have made in boosting Sino-British relations, Wen invited them to visit China in the future and wished that they could continue playing their part in promoting mutual understanding and cooperation between the two countries. China's support to Britain and Europe is not merely in words, but in concrete actions, Wen noted, adding that he brought with him sincerity and hope in the visit. China is willing to comprehensively deepen its exchanges and cooperation with Britain and Europe on the basis of mutual respect and equality, the premier said. It is in the fundamental interests of both sides and contributes to world peace, stability and development, he added. When meeting with Wen, Blair said, given the instability and uncertainties in the world's political and financial spheres, enhancing the Britain-China relationship has become more important and imperative than ever. Brown noted that Britain highly values China's status and that bilateral cooperation enjoys broad prospects. Both former British leaders were confident that Premier Wen's visit to Britain will give impetus to the development of bilateral ties. Wen is expected to meet British Prime Minister David Cameron on Monday to discuss bilateral cooperation and other issues of common interest. Wen arrived in Birmingham Saturday on a three-day visit to Britain, the second leg of his three-nation tour which also includes Hungary and Germany.